Collagen Peptides Protein Powder - Grass Fed, Pasture Raised with Aminos - is currently on backorder. You may still purchase now though and we'll ship as soon as more become available. BioSchwartz has developed a unique Hydrolyzed Collagen Peptides formula with our team of professionals using stringent quality-control standards to ensure a premium boost of collagen peptides to our consumers. 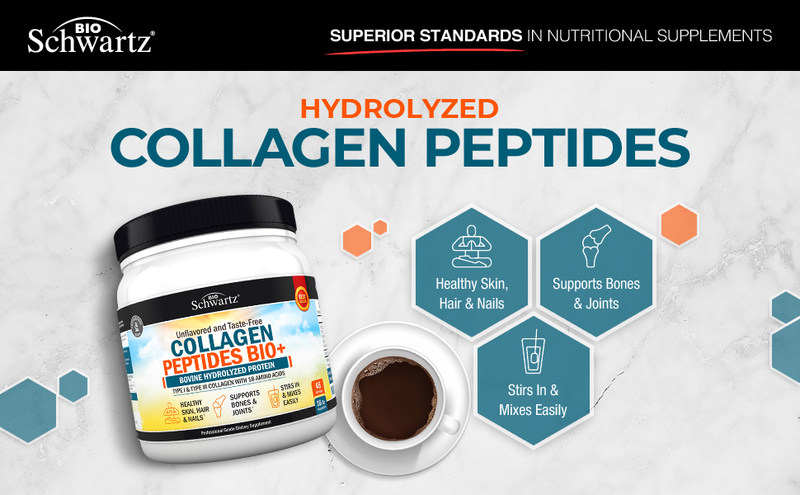 Our proprietary collagen peptide blend contains Type I & III collagen with a combination of over 18 amino acids sourced from Non-GMO, Pasture-Raised, Pasture-Fed Cows. This clinically developed formula features small highly bioavailable peptide particles which are easily absorbed to stimulate collagen production at the cellular level for maximum results. This neutral tasting formula, contains no artiﬁcial colors, ﬂavors, sweeteners, preservatives, ﬁllers, binders or harmful chemicals. It is free of lactose, gluten, soy, wheat, milk, tree nuts, peanuts, eggs and ﬁsh/shellﬁsh. At BioSchwartz, we take product quality and safety to new levels and follow a strict manufacturing process. PROUDLY MADE IN USA. Our Hydrolyzed Collagen Peptides for healthy skin, hair, and nails is manufactured in the USA. We establish stringent quality control standards in our manufacturing facility and manufacture all our supplements to exceed expectations set by cGMP (Current Good Manufacturing Practices). Being a Professional Grade Supplement Company means that we use only natural and high-grade raw ingredients, which are routinely tested for purity and quality. FORMULATED BY PROFESSIONALS. Each one of our supplements is created by a team of highly experienced professionals to ensure the greatest benefits are achieved. PRODUCT SAFETY. While most companies only use 1 or 2 seals, our Hydrolyzed Collagen Peptides has 2 seals: a pre-perforated neck-band and a heat-induction inner seal. THIRD PARTY TESTED. At BioSchwartz, quality, safety and efficacy are of utmost importance. After our supplements are manufactured, labeled and sealed, we take things a step further by enlisting 3rd party, independent labs to test once again for purity and potency. These labs further analyze our completed products to ensure and verify that the ingredients in our products are pure, safe and in the appropriate amounts as listed on our labels. SUPPLIER AUDIT. All our ingredients are bought from suppliers that go through a very thorough audit process to ensure they can meet our strict safety and quality guidelines. MANUFACTURING PROCESS. During the manufacturing process, we analyze samples every 15 minutes and visually inspect every single bottle at the end of the production line. OUR COMMITMENT TO EXCEPTIONAL QUALITY. At BioSchwartz, we create superior products through the perfect balance of the latest technologies and the finest nutrients nature has to offer. We are committed to providing the highest quality supplements. WHY CHOOSE BIOSCHWARTZ HYDROLYZED COLLAGEN PEPTIDES? As we age, our collagen production levels decrease. Wrinkles and fine lines appear as a result. Hair can lose its youthful glow and nails can become brittle. Fight back with our Collagen Peptides to stimulate collagen production to restore that youthful glow! Joint health and bone strength can also fall victim to aging. Collagen works to support overall joint health by helping to repair tissues and cartilage to restore flexibility. Bone structure can also see benefits from collagen usage. Start your morning off right with a scoop of BioSchwartz Hydrolyzed Collagen Peptides in your coffee or other favorite beverage! It mixes in and dissolves quickly into beverages. No flavor is added!